You’ve been waiting patiently. We’ve been busy getting the licensing contracts. Now, everyone can know what IT (Incredible Theater) is. [title of show] The show within a show about a musical theater show. OEDIPUS FOR KIDS! Blind people, familial love, communicable diseases, and more. DISENCHANTED! The musical comedy that gives fairytales the bird. YOU’VE GOT RED ON YOU. – Bootless’ original Shaun of the Dead bloody parody. 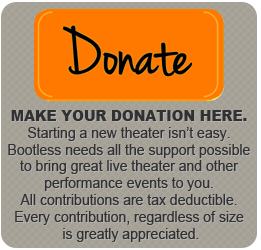 Please check the individual page for each Bootless show for further information including performance dates and time, ticket prices, and more. BOOKMARK OUR SITE. CHECK BACK OFTEN. SIGN UP FOR OUR EMAIL NOTIFICATIONS. Additional events including concerts, comedy and more are added as events are booked. See what Special Events are coming to Bootless.